Last year, I reviewed The Devotion of Suspect X by Keigo Higashino. 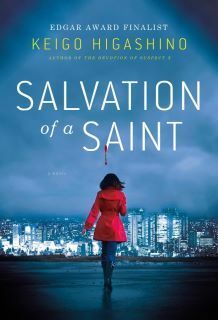 A translation that was published in 2011, it was the first “new” novel that I had read for the blog and when I found out that a second novel was about to be translated, Salvation for a Saint, I perked up and kept track of the publication date. On the day of this novel’s release I purchased an audiobook. I loved The Devotion of Suspect X, and was hoping to once again get a clever story with good characterization. Well, Keigo Higashino has done it again. This is an improvement over The Devotion of Suspect X. Once more, it’s an inverted mystery, and once more you know who the killer is. But the author turns it into an impossible crime novel, and manages to pull off a daring piece of sleight-of-hand! The plot is a simple enough one: a wife, Ayane Mashiba, decides to poison her husband Yoshitaka, a man so selfish that he was going to divorce his wife because she hadn’t given birth to a child. 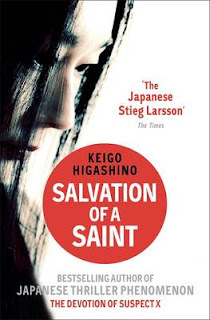 But, trickster that he is, Keigo Higashino forgets to tell you just how she murders Yoshitaka, who meets his Maker thanks to poison in his coffee. But Ayane was responsible… or was she? It turns out she was miles away at the time, with plenty of witnesses to back her story up. And events leading up to her husband’s murder prove that she couldn’t have poisoned his coffee beforehand. One of the detectives assigned to the investigation begins to fall in love with Ayane, but the other detective stubbornly clings to her belief that Ayane is the killer. And so, “Detective Galileo”, Manabu Yukawa, is drawn into the case in order to explain just how the poisoning could have taken place. And this explanation is going to polarize readers. (In fact, reading Amazon reviews, that’s precisely what’s happened, though at the moment the lowest review is only at 3 stars.) Some will love its audacity, and others will hate it and call it unrealistic. I don’t particularly care about realism—at least, as long as the plot doesn’t involve a midget jumping into a toy helicopter to create an impossible crime. And to the author’s credit, he does realize what many readers will object about in this solution, and it becomes a major theme of the finale. And yet—it’s a diabolically clever method. It takes a lot of audacity and nerves of adamantium. But you get every opportunity of deciphering the method for yourself... and, well, I liked the solution. At first, my mouth was gaping and I thought to myself “no way you’ll ever get me to buy this!” But as the author explained slowly and addressed my objections, I found myself liking the solution more and more. I really don’t want to say too much here, so let’s move on. The characterization is superb. There’s a particularly moving portrait of Hiromi Wakayama, Yoshitaka’s lover. We find out that she is pregnant, and she has to decide whether to keep the child or not. Her instinct is to keep the child, but she feels a lot of pressure to abort it and she feels as though that were her only reasonable choice. But she cannot bring herself to do it and time is slowly running out. I found this a fascinating portrayal and I will leave it to readers to discover what her ultimate decision is. There’s also a terrific portrayal of the detectives investigating the crime: for instance, I really liked how that the chief of police is an observant man, although at first he seems like yet another dumb bureaucrat. Nothing is quite like it seems in this novel. Overall, Salvation of a Saint is an excellent read. The solution to the impossible poisoning will probably polarize readers, but the more I think about it, the more I end up liking it. The characters are excellent and there are some interesting moral dilemmas. The stakes aren’t exactly high—this isn’t a Bond movie, after all—but they are personal. And in this case, that’s every bit as fascinating for me. So yes, I recommend this novel, and I will keep my fingers crossed, hoping for more! It's been a while since I read this one, but I do remember that I liked this novel ^_~ The trick is indeed one that readers might object to, but I thought it reasonably fair, as there are (thematic) hints everywhere. I think it's already decided that the (novel) sequel, A Midsummer's Equation will be translated. No plans for the short story collections. I sure hope you're right about another translation. And who knows-- it might open the door to more authors being translated in the future! This one has been added to my wish list! 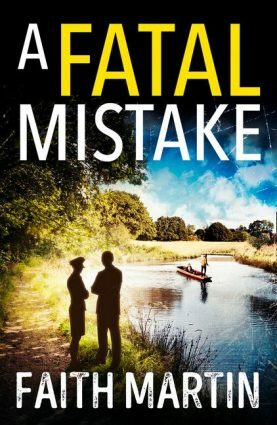 I always love it when a mystery convinces you its solution is actually quite clever, after you have put the book away and digested it.